Hey everyone! For those who were waiting for yesterday's blog post, sorry about that! Our internet was down, but it's back up and running and I'm ready to tackle today's post. Thanks for hanging tight. Today I'm wrapping up my posts on all the Cars Land 5th anniversary art (5"x7" postcard size prints) that I've been reviewing over the past couple months. Last, but certainly not least, here we have "Cutest Little Town in Carburetor County" by my friend and popular Disney freelance artist, Jerrod Maruyama! I know I've mentioned this countless times, but Jerrod is one of my all time favorite Disney artists (not to mention one of the nicest guys). If you're unfamiliar with his work, be sure to check out his blog HERE. If you like what you see (how could you not), you can also follow him on Facebook, Instagram, Tumblr, Flickr, Dribbble and Twitter. As you can see, Jerrod specializes in all things cute and is quite the master. 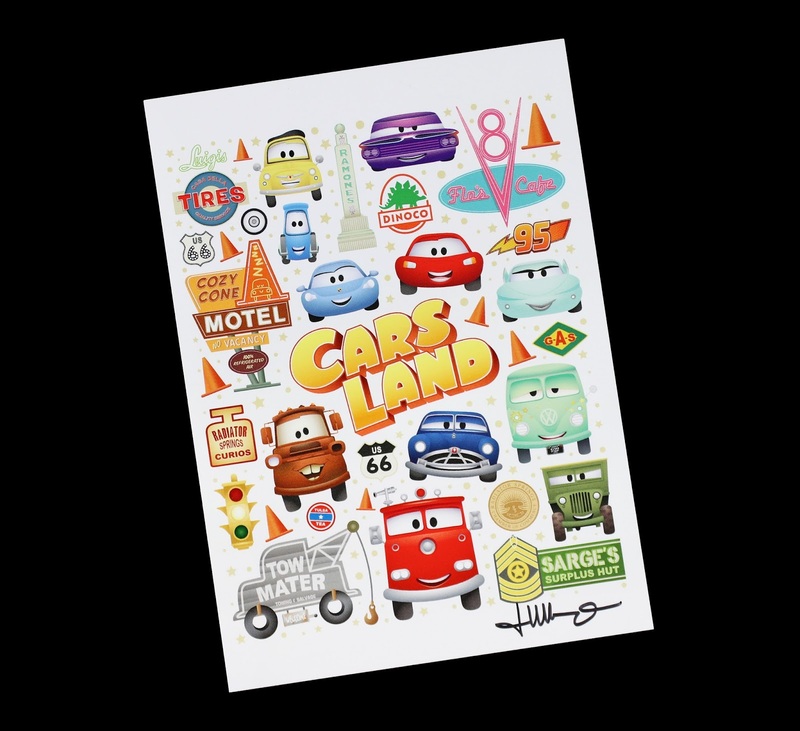 As a dedicated fan of the Cars franchise and Cars Land, I absolutely adore this print and was so thrilled to see it was coming! I couldn't wait to get my hands on it and it doesn't disappoint. It's 100% Jerrod's signature style that I know and love, done in the same vein as his "world of..." series of prints (which are some of my favorites). 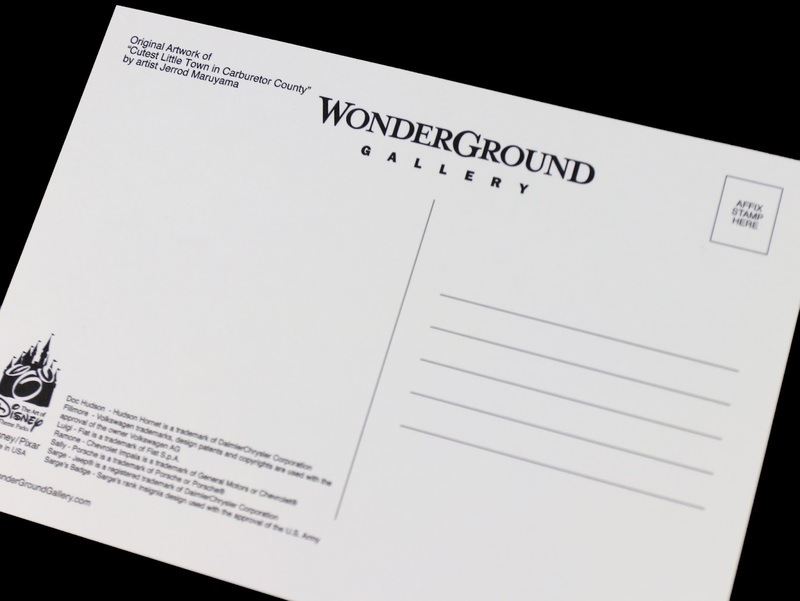 Retail is $4.95 for this postcard size. 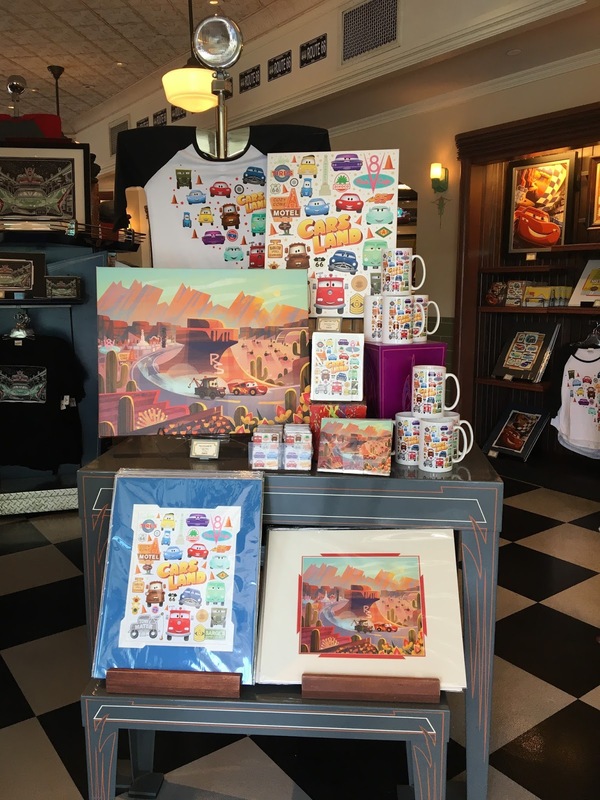 Jerrod's cute stylization of the classic Radiator Springs townsfolk is amazing, not to mention all the nods to iconic Cars props, shop signs, logos and other designs that he threw in surrounding the characters as well. The details in this print are stunning as usual (and the title is brilliant, utilizing a perfectly suited quote from the original film). My hat goes off to Jerrod for all the thought and work that I know went into creating this piece. As shown in my photo below (taken during our trip to California Adventure this past July), you can pick up this print at the Ramone's House of Body Art gift shop (it should also available at the WonderGround Gallery at Disney Springs/Downtown Disney). And what's cool is that this design is also available on a T-shirt, a mug, a magnet set and on a bigger deluxe size matted print! If I had the space in my luggage, I probably would have gotten it all— it's just that good. A huge thanks to Jerrod for sending me this signed copy of the print. It meant so much to me to get it in a surprise package he sent me a little while back! And, since I love it so much, this is a print I will also have to get in the bigger matted size for my Pixar office wall. Final Note—If you missed them, check out the other Cars Land 5th anniversary art pieces I reviewed over the past few weeks: "New Wheels", "Race Around Radiator Springs", "Cozy Cone Arrival" and "Cruisin' to Ka-Chow." It's so fun to see how each artist captures the feeling of Cars in their own unique way! Coco Merchandise NOW AVAILABLE— Page UPDATE! Disney·Pixar Coco Books— NOW AVAILABLE! Disney·Pixar Coco Merch— Now on ShopDisney.com!